D.W. Griffith's spectacular silent masterpiece is available for the first time on DVD. The most successful silent film ever, The Birth of a Nation remains America's most controversial cinematic landmark. Also included is a 24-minute "making of" documentary detailing the production of the film with rare behind-the-scenes footage and more. DVD: Standard 1.33:1; audio Dolby Surround; subtitles none; single sided - single layered; 42 chapters; Not Rated; 187 min. ; $29.99; street date 11/17/98. Supplements: Mastered from Original Tinted Print; 24-Minute Documentary Detailing the Production of the Film, Including Rare Behind-the-Scenes Footage and More . With 1915’s The Birth of a Nation, we find easily the oldest film on the American Film Institute’s Top 100 movies. It also provides the only silent flick on the list not directed by Charlie Chaplin, as his The Gold Rush, City Lights and Modern Times comprise the other remnants of the era. Those are the facts that relate to the relationship of Birth and the AFI 100. More subjective is the possibility that it’s the most controversial film on the list. Although more than 85 years have passed since the movie’s initial release, nothing has quelled that furor about it. Mainly, the debate that regards Birth connects to the emphasis of technique over content. As with the propaganda films that Leni Riefenstahl created during the Nazi period, D.W. Griffith’s work has often been praised for its technical merit and its innovative story-telling methods all while being condemned for its content. And what of that notorious content? Birth is an early epic that covers the Civil War and the Reconstruction period in the South. Much of the tale is told through the eyes of two families, the Stonemans from the South and the Camerons from the North. The two clans are intermingled due to friendship and romantic overtones, and it’s through their eyes that we watch war unfold and see how the union tried to recover after the end of that conflict. When Birth sticks with the Civil War itself, it’s a fairly compelling film. Griffith depicts the battles with an intensity and style that seem surprising for such an old movie; no, it doesn’t compete with the visceral horror of something like Saving Private Ryan, but the sophistication of Birth’s techniques appear very advanced for the era. Many regard Griffith as the virtual creator of the motion picture feature - as opposed to crudely-filmed short pieces - and it’s hard to argue with his influences when one sees the work found in Birth. That said, Birth can be a tough viewing for modern eyes, and not just for the infamous story elements that I’ll discuss soon. At their best, silent films remain charming and compelling, something I discovered through those Chaplin works I mentioned earlier. However, the form had matured a lot between Griffith’s work in 1915 and Chaplin’s efforts of the mid-Twenties through mid-Thirties. Birth shows a maturity that seems advanced for its era, and it may have been tremendously influential, but the stylistic conventions of the period - especially the extremely broad acting - can create a film that becomes a chore to watch. Nonetheless, much of Birth is interesting and compelling - through the assassination of Lincoln. Actually, I never could figure out Griffith’s view of Honest Abe. The sixteenth president is clearly revered as portrayed here, but this position makes little sense when we watch all of the material that follows his death. Make no mistake: after the end of the Civil War, the South was ripe for the picking by sleazy folks looking to make a buck or a name for themselves. In some ways, Birth depicts this unsavory chapter of history well, but it goes badly overboard through its vision of black citizens. Griffith shows blacks as primitive and borderline evil and indicates that they posed a threat to the very existence of the South and perhaps the union as a whole. Who does Griffith present as the saviors for the nation? Why, none other than the Knights of the Ku Klux Klan! To call this a heroic portrait of the infamous band of bigots is a drastic understatement, as Birth seems to put the Klan on a par with the Founding Fathers. Such a ridiculous misrepresentation of this group would be offensive enough, but the manner in which Birth shows blacks makes it even less palatable. In addition to the film’s grossly stereotypical depictions of many characters, we get a less than subtle message as well. When blacks function as servants who toil for the whites, they’re shown as faithful, sensible and warm. However, when they have the audacity to put themselves on the same societal level as whites, they’re portrayed as crude, rude, nasty and negative in virtually all ways. One doesn’t have to be “politically correct” to be offended by this material, and Birth stirred up a great deal of protest even during the less “enlightened” period of its initial release. The post-Civil War sections of the movie truly are indefensible. They offer extremely flawed history and function as nothing more than bad propaganda. Some think that due to its often-negative content, The Birth of a Nation should be stricken from the lists of great films. However, that viewpoint is as narrow-minded as the racist ideas propagated by Griffith. There will always be a dilemma involved when one tries to separate the medium from the message; in recent weeks we’ve seen the same concern when many praise the music of Eminem but condemn his attitudes. Love it or hate it, Birth was a seminal work that still seems fairly impressive almost a century after its creation. Even at its best, I didn’t find the film to offer a particularly enjoyable experience, but the movie’s historical significance puts it on a list of “must see” pictures. 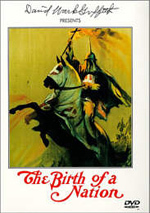 The Birth of a Nation appears in an aspect ratio of approximately 1.33:1 on this single-sided, double-layered DVD; due to those dimensions, the image has not been enhanced for 16X9 televisions. The extreme age of the film makes it somewhat hard to accurately gauge the relative quality of the presentation. As such, my “D+” stems mainly from the actual look of the movie and isn’t an indication of how good or bad Birth appears in comparison with other features of the era; while I was fairly forgiving of a number of flaws because of the picture’s age, I simply haven’t seen enough material from the period to adequately judge the relative quality. In any case, I found Birth to be generally watchable despite its many defects. Sharpness was a moderate strong point. Although the image never presented terrific clarity, I found it to seem largely accurate and distinct. Some moderate softness interfered at times, but most of the film looked properly focused and sharp. A few minor examples of moiré effects occurred, but these were rare and mild. Birth used three different kinds of shading. Most of the film either appeared in sepia tones or was true black and white; I saw no rhyme or reason to the utilization of the two as the movie flip-flopped back and forth between them. More obviously purposeful was the use of a purplish-red tint at times. This hue popped up much less frequently than either the black and white or sepia tones, and appeared mainly whenever fire factored in to the story. Some scenes didn’t overtly demonstrate flames but featured the purple/red nonetheless; however, these segments fit the manner of the fiery sequences and made sense in that way. The dark tones usually looked fairly deep and dense, but contrast showed quite a few problems. Much of the film either appeared too light or too dark, and shadow detail could suffer as a result. Many scenes seemed excessively difficult to discern, and most of the movie fails to maintain the correct balance between light and dark. As a whole, I didn’t find this issue to be horribly problematic, but it did affect the viewing experience. As one might expect of such an old film, the main concern I found as I watched Birth stemmed from the quality of the print. Not surprisingly, the image betrayed a vast number of flaws. Pretty much every defect one could imagine made an appearance. Scratches and tears were exceedingly frequent problems, and a variety of speckles, blotches, and lines also appeared. Many times I saw that frames were missing and the picture often jumped or skipped. The image also seemed jittery much of the time. Frankly, the only potential flaw that didn’t look evident was grain, which I really didn’t notice. However, I expect it’s there but not obvious due to the other defects; there were so many problems with the print that grain was the least of my worries. To some degree, the myriad of problems didn’t really bother me; I expected such concerns in an 85-year-old movie. But should I? Again, this is where my lack of experience with really old films hampers me. I’ve only ever reviewed one DVD that features material made before the late Twenties: “Pool Sharks” from the W.C. Fields Six Short Films release. However, it looked quite good; it displayed some problems, but not nearly the amount seen in Birth. I gave that short a “B-“ grade, and I think that as a comparison, Birth earns a “D+”. That ranking may actually be a little too generous but I awarded it because the flaws weren’t radically unexpected for such as old piece; if I were to see more films from the era, my grade may rise or fall, but right now it seems about right. Much easier to judge is the Dolby Surround soundtrack of Birth. Since the actual original film had no audio attached - as with other silent movies, musical accompaniment came from a live performer in the theater - the sound heard on the DVD comes from a new recording of appropriate music. As such, the soundtrack only features a score; there is no evidence of speech or effects. As a whole, the music sounded quite good. Solid stereo separation made the track spread nicely across the front channels, and the surrounds contributed minor but decent reinforcement. The quality seemed fine. The music was crisp and clear and displayed positive dynamic range; the styles used in the film didn’t feature a great deal of bass, but the highs were clean and bright, and what low end I heard appeared rich and accurate. It was difficult to grade the soundtrack as well just because I wasn’t sure against what I should compare it. Nonetheless, a “B” felt right; the music sounded smooth and strong and complemented the material well. The Birth of a Nation lacked many supplemental features, though we do find a documentary about the film. The Making of The Birth of a Nation lasts 24 minutes and it offers a dry but decent look at the movie’s creation. Through narration and a variety of period materials such as stills, shots from the film and others of the era, and - most surprisingly - outtakes from the making of Birth, we get a pretty good little overview of the processes used to create it. The program lacks much depth, and we don’t learn much the personal thoughts of Griffith or any other participants, but the show still merits a look. After many decades, The Birth of a Nation remains one of the most revered - and most controversial - films ever created. While it's a flawed and often hateful piece, its place in movie history cannot be denied; if nothing else, that prominence makes it compelling. The DVD offers a picture that seems acceptable for a film of this age, but it looks no better than that. The more-recently recorded score fares better, and a decent documentary adds a little perspective to the package. The Birth of a Nation is not a film I'd ever care to see again, but it was definitely something that I'm glad I watched.